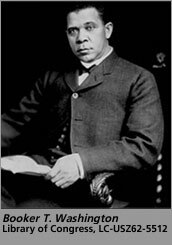 Booker Taliaferro Washington rose from slavery to a position of power and influence. A realist and a man of action, he became one of the most important African-American leaders of his time. He was committed to improving the lives of African-Americans after the Civil War. Washington advocated economic independence through self-help, hard work, and a practical education. His drive and vision built Tuskegee into a major African-American presence and place of learning.